Blue Project Software - BlueDoc is a document management system.When you use BlueDoc DMS you have the advantage of a powerful system necessary for designing storing and controlling the documents in the electronic format. * You can define your own categories of documents and assign them additional information for classification purposes thus simplifying their further retrieval from repository. 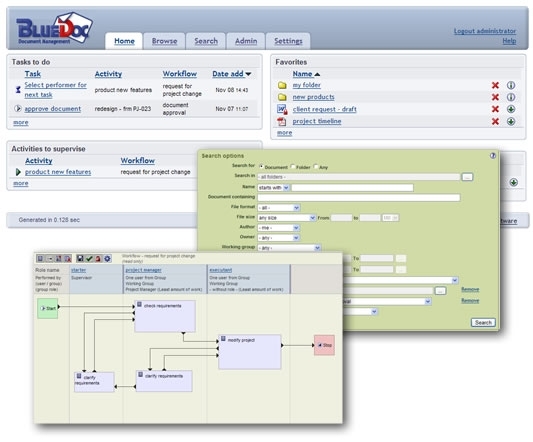 * Documents can be grouped and organized into folders having hierarchical structure. * Featuring an efficient indexing engine BlueDoc allows you to easily request queries based on multiple criteria which may include even full-text search for popular file formats such as Word Excel PowerPoint PDF HTML text and so on. 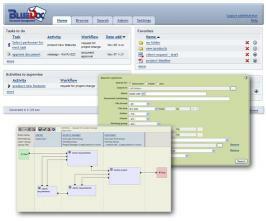 * BlueDoc is a web based server designed especially for concurrent usage by many users. It gives you the possibility to create user groups with detailed specification of rights and access levels to various stored folders and documents. * Using BlueDoc you can define workflows to improve the circulation of the documents in your office. The workflow definition can be easily accomplished using the provided graphical tool which let you detailing the characteristics of the workflow by establishing the component tasks and assigning them to users. * As the document undergoes various modifications new versions of the same document may be created and stored for review or later possible usage. Introduced Application Rules in order to configure how to change properties of documents and folders when operations like Create Copy Move Archive or Restore occurs. Archive management and Workflows are improved.